Washington, D.C to demand a vote to pass ' The Green New Deal' in March of 2019. Photo by Aurora Samperio/NurPhoto via Getty Images. 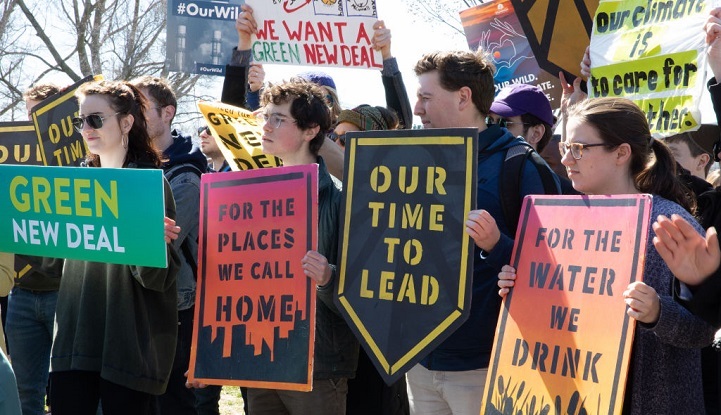 The average congressional opponent of the Green New Deal has received 24 times more campaign cash from the nation’s largest oil and gas companies than sponsors of the climate change resolution, according to a MapLight analysis. The 90 House sponsors have received a total of $37,175 in campaign donations -- an average of $413 each -- from the 10 largest publicly traded U.S. oil and gas companies since 2017. Meanwhile, the 344 opponents of the resolution cumulatively received 91 times more money. The opponents, who include all 197 House Republicans and 145 Democrats, took almost $3.4 million from the energy companies, an average of $9,876 per lawmaker. ExxonMobil, the Irving, Texas-based descendant of the Standard Oil Co. that’s become the largest publicly traded energy company in the world, gave the most donations of any oil and gas company, contributing more than $848,000 to House members since 2017. Only $8,400 -- less than 1 percent -- of the ExxonMobil contributions went to Green New Deal sponsors.